In order to slice a golf ball (impart a left to right ball flight for a right handed golfer) you have to strike the golf ball in a manner that will cause a clockwise rotation of the ball. The more dramatic the rotation the more dramatic or worse the golf slice. For the context of this article, I will speak from a right handed golfer’s swing and perspective. When defining the golf slice there are a couple of basics characteristics to the ball flight. First, there is the slice that initially may start down the target line then move off line in a left to right movement. This type of slice tells us that the swing path was traveling down the intended target line, but at impact the club face was left open and did not get back to a square position at impact. Usually this type of golf slice doesn’t produce as sever of left to right movement of the golf ball since the swing path itself was not cutting across the ball in an outside to inside manner. This type of slicing of the golf ball is more easily cured. And can usually be done so with a bit of work on the golfer’s setup, alignment, and or grip. The second type of golf slice is the one that plagues the vast majority of beginning and high handicap golfer’s. This is the type of slice that produces the ‘banana ball’ type of flight and is very uncontrollable and frustrating. The attributes of this type of slice for the golfer are the ball will initially start left of the target line indicating that the swing path is incorrect right from the get go. When the ball immediately begins left of the target line that tells you that your swing path has come from the outside to the inside. 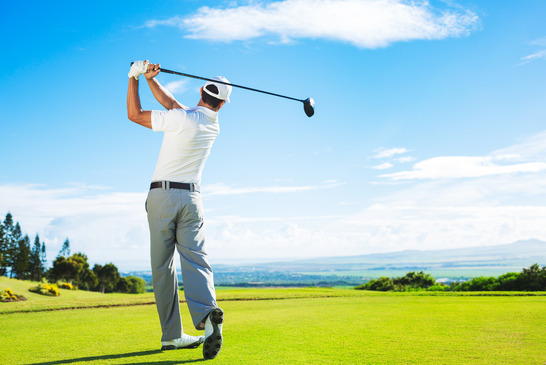 Now, having done that with your swing, doesn’t necessarily guarantee that you are going to slice the golf ball but you sure have made much easier for a slice to occur. Now combine the outside to inside swing path with an open clubface at impact and you now have a golf shot that starts left and has the double whammy of a slicing swing path across the golf ball, and an open club face. With these two laws of physics going for you; you have just produced one beautiful slice. One that only a proud parent could love! You know the one I’m talking about. The ball that travels 300 yards total distance, but only about 220 yards further down the course (if you can find it all). A golfer who is plagued with this type of golf slice is going to require quite a bit more work in order to correct this because their basic swing is flawed and must be corrected. But, it’s important to understand what it is in your golf swing and your golf swing mechanics that makes the ball do what it does. Once you understand the 9 rules of ball flight you’ll be more able to understand what it is in your swing that is producing the flight of the ball you are seeing, and as such you can more quickly address and adjust to ensure success. Tags: Course, Swing, Grip, Golf Swing, Golf Slice.